One such notification as “Running out of memory” in your flagship Smartphone like iPhone can trigger annoyance and at this moment people first turn out to their gallery, music and other stuff they feel unimportant to free up space. But are you sure you want to delete those photos and videos you captured to free up iPhone space and regret it later? You might not be. Well, the smartphones are not called smartphones just because of the touch feature or browsing capabilities but because it possesses smart features and one among those smart features is “Backup”. The backup feature lets you copy your data into an archive file and helps in restoring the original data whenever the data is lost. Backing up the files or data becomes necessary to ensure you don’t lose any data after the data loss event or uncertainty. When using a flagship smartphone like iPhone, you get an inbuilt iTunes tool for daily backup, freeing up space or upgrading to the new iPhone series or iOS 12. But after a lot of surveys out there, the feedback and reviews state an average answer, that the iTunes is not the perfect tool to backup or sync iPhone to Mac book Air/Pro or iMac because of its ill-functioning and drawbacks, because of which people are reaching out for the best iTunes alternative. The introduction of MacX MediaTrans turned the heads of many iPhone users and is now considered to be the best iTunes alternative, as it assists the users to transfer photos from iPhone to Mac and vice versa. Not just the photos, it also allows transferring of other files like music, videos, etc. 1 What makes MacX MediaTrans a smart option over iTunes? What makes MacX MediaTrans a smart option over iTunes? 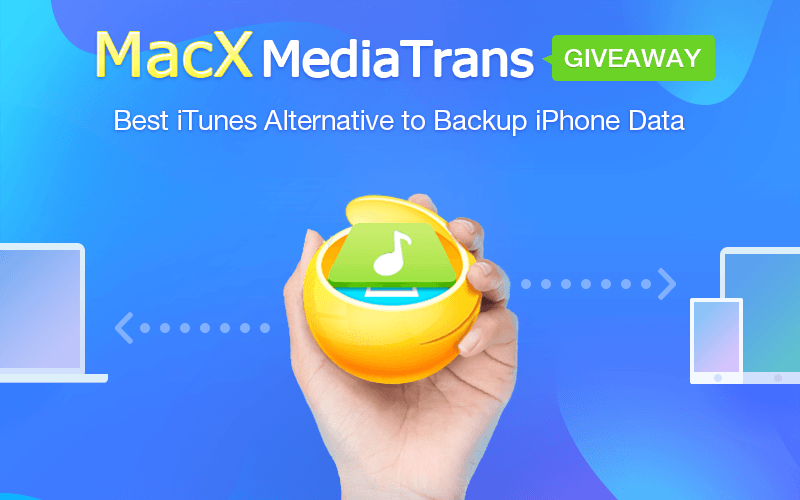 Few aspects that make the MacX MediaTrans a smart option to choose over iTunes to backup iPhone X/8/7/6s or the latest iPhone XS are listed below. Smarter – Enables two-way sync photos, videos, and music between iOS and Mac. It auto compresses the large 4K, HD videos file to save the space and auto-converts video format for iOS. It comprises of bonus features like turning iPhone into the hard drive, encrypting iPhone and Mac files and creating iPhone ringtones. Better – It is easy to operate, with stable operations and no necessity to fix iTunes errors. It also supports transferring non-iTunes music files and videos other than video formats accepted by iTunes such as MKV, AVI, FLV, and WMV. It has more powerful music file management abilities and supports modifications like adding, deleting or editing the playlists on Mac. Finding it as the best iTunes alternative for your iPhone device? Then why not join the holiday giveaway on MacX MediaTrans and transfer photos from iPhone to Mac, transfer music from Mac to iPhone and just enjoy the exporting and importing of the media files and data without iTunes limits. Hurry up! The giveaway ends soon and is valid till 31st of January 2019. Transfer photos at the speed of 8 sec for 100 4K photo and also auto convert photos (HEIC to JPG) or to any compatible format with editors, and compatible devices. Delete photos from iPhone on Mac and fix iTunes errors, while swiftly transferring of all the iOS data. Auto convert videos to compatible iDevices formats through Mac, Camera, GoPro etc. Also auto reduces (up to 50%) file size to save storage space. Delete videos from iPhone on Mac and move bulky videos to computer or hard drive. Transfer specific music files, and manage them with ease without iTunes limit. You can also transfer iPhone music from iTunes to the computer and downloaded music from Mac to iPhone and iPad. Export media files to Mac with encryption and secure them with password encryption. The tool comes with military-grade encryption techs like AES 256 and many more. The tool supports 8 audio formats, auto converting music to iPhone MP3/AAC. It also enables syncing ringtones at one go. To save the data like Word, Excel, PDF, apps etc., secretly you can turn iPhone into USB. iTunes may be a brilliant tool but is also a trouble maker at the same time. So why not switch to something like MacX MediaTrans that lets you enjoy backups and exporting, importing of files.